The Hobbit Signed by J. Tolkien First Edition First Impression George Allen & Unwin Ltd 1937. The Hobbit Or There and Back Again. No inscriptions, completely unblemished and unmarked throughout. Top edge green with no fraying or splitting. Corners still very much square and no fading or toning to spine at all. The dust jacket is the original first state, correctly priced at 7/6 and with the Dodgson correction. It has minimal and incredibly skilful internal paper strengthening / restoration to light rubbing on the spine tips / folds (approximately 3mm). Still remarkably bright and crisp, with no browning or fading to the spine. Internally, the flaps have remained white. Seldom seen in this condition. Loosely inserted is a pro forma acknowledgement of a fan letter sent to Professor Tolkien in January 1965. It was sent by an Oxford University undergraduate and has been signed and dated by Tolkien in blue ink. The book comes in a bespoke, hand-crafted Clamshell bookcase which is gilt-stamped at the spine. It features a blind embossed'Mountains and Dragon' design, raised across three panels with gilt stamping. The bookcase is finished inside and out in elegant Black Nuba, with leather and hand crafted marble paper sides. This clamshell is perfectly sized to accommodate the first edition only. 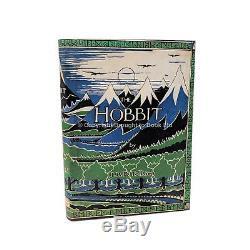 The item "The Hobbit Signed J. Tolkien First Edition 1st Impression George" is in sale since Sunday, May 13, 2018. This item is in the category "Books, Comics & Magazines\Antiquarian & Collectable". The seller is "jrl1979" and is located in London. This item can be shipped worldwide.